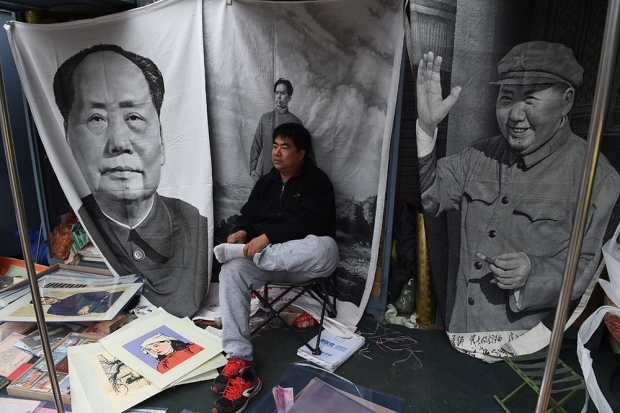 A vendor waits for customers for wall hangings of Mao Zedong at a Beijing market last month. A shorter version of this article was originally published in The National Interest, No. 140 (November/December 2015), pp. 73-81. This version is published by permission of The National Interest. The ideological competition between democracy and authoritarianism was supposed to have died with the Cold War. But it has returned with a vengeance, powered above all by the rise of China. Now comes a book by a respected scholar that purports to explain the secrets of the China model, and to show why it works better than liberal democracy. The recently book The China Model: Political Meritocracy and the Limits of Democracy, by Daniel A. Bell, will have wide influence because of Bell’s academic credentials, his accessible writing style, his wide-ranging knowledge of both China and the West, and his energetic convening of conferences and symposia. But The China Model is not an account of the real China. Just as Western thinkers for centuries have constructed images of China to wield as weapons in their polemics with one another, so too Bell presents an imaginary China as a rhetorical platform from which to continue a long-standing debate internal to Western political thought—the debate between liberal democracy and communitarianism. His book will mislead any reader who looks to it for an understanding of China. Communitarianism—as Bell explains in his entry on that subject for the online Stanford Encyclopedia of Philosophy—“began in the upper reaches of Anglo-American academia in the form of a critical reaction to John Rawls’ landmark 1971 book A Theory of Justice.” Rawls’ book provided a twentieth-century update of the classic social contract theories that laid the conceptual groundwork for liberal democracy. Communitarians, Bell writes, objected to Rawls’ theory on three grounds: its pretension to define values that are universally valid for all cultures, its emphasis on individual autonomy at the expense of the social attachments that people need for their sense of well-being, and its exclusive focus on personal fulfillment at the expense of the “concern with bolstering families, schools, neighborhoods, and national political life.” Communitarians did not oppose democracy. But they proposed that it should be legitimated and organized in such a way as to take account of certain realities: that values vary across cultures, that the individual is socially embedded rather than isolated, and that the welfare of the community is as important to the good life as the welfare of the individual. As a McGill undergraduate, Bell was influenced by Charles Taylor, who, among other contributions to communitarianism, sought to solve the problem of an over-ambitious universalism by proposing “a genuine, unforced international consensus on human rights” among cultures. (One of Taylor’s essays on this topic was published in The East Asian Challenge for Human Rights [Cambridge University Press, 1999], which Bell coedited with my wife, Joanne R. Bauer.) Bell went to Oxford for his Ph.D., where he worked under the direction of David Miller, who argued in his book Principles of Social Justice (Harvard University Press, 1999) that there is no single criterion of justice, but that different societies place different degrees of emphasis on its various aspects. Bell’s intellectual curiosity and his skill at networking are evidenced by the long lists of acknowledgments in his books, each including a mix of independent academic experts, Chinese government officials, pro-China apologists, and human rights activists (although none of these activists, so far as I can see, is from inside China). Not everyone with whom he has worked necessarily agrees with everything he says. But he is positioned in the center of an extended network of academics and other thinkers who share various elements of his beliefs. Confucianism is a body of thought so long-lasting and disparate that some have questioned whether it constitutes a coherent philosophical school. The scholar Lionel Jensen, in Manufacturing Confucianism (Duke University Press, 1997), argued that the idea of a distinctive Confucian “ism” was an invention of the early Jesuit missionaries in China, who sought to counterpose a Chinese religion to their own for purposes of preparing the battlefield for conversion. Like other ancient texts, the Confucian classics are infinitely malleable. A leading specialist, my Columbia colleague Wm. Theodore de Bary, developed a distinguished body of work demonstrating the individualistic and liberal themes in the work of certain Confucian thinkers. The American philosopher Stephen C. Angle argues that Confucianism is compatible with popular democracy and human rights. Hong Kong political scientist Joseph Chan finds resources in the tradition to justify limited government, individual moral autonomy, and women’s rights. But most modern Western and Chinese scholarship has viewed Confucianism as a collectivist, hierarchical, and authoritarian ideology that emphasizes the subordination of individual interests to those of the family, deference to elders, and oppression of women. In China, the government has recently promoted a Confucian revival, stressing the values of social harmony and deference to authority. It has restored and museumifiedConfucius’ ancient home of Qufu, Shandong, inserted its version of Confucian values into school textbooks and state propaganda, and promoted China’s image abroad through its Confucius Institutes. There are also some independent Confucian thinkers, among them Jiang Qing and Yan Xuetong, whose books, respectively A Confucian Constitutional Order: How China’s Ancient Past Can Shape Its Political Future (2012) and Ancient Chinese Thought, Modern Chinese Power (2011), are included in Bell’s Princeton University Press series. Both Jiang and Yan advocate a concept called Humane Authority, or rule by moral exemplars in the general interest. Jiang explains how Humane Authority can be used to govern China, while Yan explains how it can be used to govern the world. Hierarchy, deference, and elitism are ideas well rooted in the tradition of Western conservative thought, and they derive their relevance for Bell’s work from debates internal to the history of Western political thought. So why travel to the East to discover them? Why take the trouble to label them as Confucian? To do so, one must enter into laborious debates over the meaning of ancient texts, written by authors from a different society and a different time concerned with different issues. Bell frequently makes the appropriate assertion that in studying Confucianism one must avoid essentialism. Nonetheless, to characterize a set of values as Confucian (rather than as, say, communitarian or Burkean), one must locate these values within that tradition. This has involved an enormous amount of digging for Bell and his collaborators. One answer may be that those whom Bell is concerned to criticize—Western liberals—are constrained by their own belief system to listen respectfully to criticisms derived from a major foreign belief system; in other words, communitarians can borrow the prestige of Confucianism to motivate liberals to pay more respectful attention to their criticisms. A second answer might be that Confucianism contains elements that strengthen those features of communitarianism that Bell wishes to emphasize, making the philosophy more elitist and authoritarian than its earlier proponents intended. Third, while communitarianism is chiefly a critique of liberal democracy, Bell and his colleagues’ version of Confucianism is a complete political philosophy for the modern world, summed up in the concept of Humane Authority. Bell’s latest book, although surely not his last, is something of a summa of the themes he has developed over the years. The title of the book plays on the ambiguity of the word “model”: is a model something real, or something possible? But in fact the model he describes is neither real nor possible. The book is instead a continuation of his long-term polemic against liberal democracy, framed as an imaginary of China. Bell’s China model has three features: “democracy at the bottom, experimentation in the middle, and meritocracy at the top” (p. 9). At the bottom, a regime can generate legitimacy by allowing citizens to vote for local leaders. (By this he means the village level, which is so close to the ground in China that it is not formally considered a level of government. Elections somewhat above the village level are desirable but he believes not possible for the time being, and he does not consider them desirable at the national level.) In the middle, the system can encourage the creation of smart policies by allowing different jurisdictions some flexibility to find policies that work. And at the top, the system can promote public-minded decision-makers who are the most qualified in terms of dual criteria that he labels “ability and virtue” (p. 6). Most important to the China model in his view is this last feature, meritocracy: “My book,” he says, “is a defense of political meritocracy” (p. 4, italics in original). Bell gives a good description of formal recruitment procedures in the Chinese civil service (tough written examinations and oral interviews) and at the political level (secretive inner-Party processes that evaluate cadres on numerous criteria throughout their careers). But his conflation of the Chinese political system with meritocracy is misleading in several ways. First, as Bell acknowledges, many other factors enter into success on the greasy pole of Chinese politics, including personal relationships, corruption, and factional in-fighting. His analysis of the rise to power of China’s current leader Xi Jinping as a triumph of meritocracy will read to most China specialists as naive (p. 107). Third, to identify Chinese politics with meritocracy is to focus solely on recruitment, whereas the key feature of the Chinese system is not how leaders are selected but how they rule: that is, through the unconstrained exercise of power. Bell seems to acknowledge this but not to understand it. When he says, “The most obvious problem facing any system of political meritocracy is that meritocratically selected rulers are likely to abuse their power” (p. 112), he commits an elementary error. The abuse of power does not arise from the way power holders are selected. It arises from the way in which their power is or is not checked and balanced by independent forces in a society. The ground slips and slides under the reader’s feet as Bell goes on to acknowledge this (“the most obvious cause of corruption is the absence of independent checks on the power of the government” p. 114), then to take it back (“it is not correct to assume that Chinese officials exercise limitless power”), before shifting to discuss an irrelevant example from the Han dynasty. The biggest problem with Bell’s theory of meritocracy is that the idea of getting quality leaders to make high-performance decisions is based on the notion that there are right and wrong decisions. His criticism of liberal democracy relies partly on the idea that the democratic majority is usually ill informed and makes bad choices. “Unfortunately,… checks on voter irrationality are not sufficient to prevent (or minimize) bad policies” (p. 27). But this implies that technocrats have better answers, something that the history of reform-era China (the period to which Bell limits his discussion) does not show to be the case. China’s post-Mao leaders have made some good decisions—especially in freeing up the economy—and many bad ones, among them in environmental policy, ethnic relations, human rights, and foreign affairs. Indeed, the various social-psychological and behavioral-economics theories that Bell cites to show that voters can be irrational apply also to leaders, and perhaps even more so to those who are undemocratically chosen, because they lack the corrective benefit of public criticism. Nor is there any reason to believe that those who succeed at the game of political ambition are morally superior to ordinary citizens—better able, as Bell claims, to “make morally informed political judgments” (p. 32). Plato claimed that only a self-perpetuating, all-powerful elite could rule in the interest of the community. Bell cites him with approval. But most commentators consider Plato’s Republic a brief for dictatorship. Bell’s critique of liberal democracy is as flawed as his praise of meritocracy. His criticisms of democratic elections are well grounded in the social science literature and are just. Even so, elections are a probably better way to pick leaders than Bell thinks; after all, no recruitment system always produces the best leaders, and democracy sometimes produces good ones. The real problem with his argument, however, is that democracy is more than a way to pick leaders. It is also a way to subject those leaders to supervision, to permit public debate over policy, and to protect citizens’ rights to speak, publish, associate, and organize, which not only create the necessary conditions for meaningful elections, but are inherently valuable in themselves. Bell treats the flaws of electoral democracy as intrinsic to the system’s design, without hope of improvement. He treats the Chinese system, by contrast, as perfectible—as he puts it, “both a reality and an ideal” (p. 180). Bell is disarmingly frank about the flaws of the Chinese system “in practice” (p. 2, passim). They include “corruption, the gap between rich and poor, environmental degradation, abuses of power by political officials, harsh measures for dealing with political dissent, overly powerful state-run enterprises that distort the economic system, repression of religious expression in Tibet and Xinjiang, [and] discrimination against women” (p. 173). This is quite a list. But to say that the system is imperfect in practice means that the flaws are not in the bones of the system, in its very conception, but in the implementation, and that this type of system, if put properly into practice, would be a good system. Hence his odd straddle throughout the book of bashing the current Chinese system while also praising it. But he does not offer liberal democracy the same courtesy of being both real and ideal. His account of democracy is limited to the flaws it exhibits in real life. Bell offers suggestions about ways in which the beneficial potentials of the Chinese system can be realized. These include making the system “more participatory and open” and allowing “more input by ‘the people’ in the form of institutionalized participation” (p. 142, p. 146). In addition, the “meritocratic system needs to be made somewhat transparent” (p. 147). These proposals are not spelled out in detail, but presumably they would fall short of the degrees of participation and transparency found in liberal democracies. The theoretically possible system thus imagined by Bell is without politics. When he proposes that the Standing Committee of the Chinese Communist Party Political Bureau—the apex of power in China—should include not only Communist Party members but “a younger person with excellent understanding of modern technology…, an expert on foreign cultures…, [and] a capitalist who has proved good at money-making” (p. 133), one wonders what he thinks the Politburo Standing Committee does. When he proposes a “meritocratic house” of a future parliament (p. 51) he supposes that its members will act unselfishly and that the rest of the political system will yield to their decisions. The trick to imagining such a system actually working is to posit that the meritocratic elite is not a political elite in any sense seen in real life, but a “moral” elite, which will rule in the public interest and command unstinting obedience in return. Indeed, Bell’s imaginary moral elite is also liberal-progressive on the Western spectrum, adopting good environmental policies, fighting climate change, and preserving the rights of non-citizens like domestic workers. But Bell proposes no mechanism by which the Chinese system can plausibly be pushed to adopt the reforms that he proposes. Indeed, after endorsing the idea of a meritocratic upper house on page 51 of the book (not for democracies, he says, but for “political systems that allow a voice for the people but without free and fair elections for the country’s most powerful leaders”), he withdraws the proposal as unrealistic even for China on page 167. The repeated slippage between the real and the ideal, the empirical and the normative, the actual and the possible, lends his writing an elusive quality, making it difficult for the reader to keep his footing as the argument proceeds. The idea of a “China model” is not original, as Bell acknowledges (p. ix). It has emerged from a debate within China over the country’s future development. (There is also a separate debate in the West using the same term, focusing more on China’s recipe for rapid economic growth without political disruption.) Few Chinese—even in the ruling party itself—claim that the system as it works in China today is perfect. The debate is over how it should develop. Advocates of liberal—or as they tend to call it, constitutional—democracy are mostly in jail (like Nobel Peace Prize winner Liu Xiaobo) or in exile. The debate inside the country includes those who call for more “inner-party democracy,” those who view authoritarianism as a developmental stage that will lead to democracy, and those who, like Bell, think that the current system is well suited to Chinese culture and needs only to make itself better. In this final category are Peking University professor Pan Wei, Shanghai-based venture capitalist and polemicist Eric X. Li, and the former Deng Xiaoping translator and regime booster Zhang Weiwei, all of whom Bell thanks in his acknowledgments and cites in footnotes. It would seem difficult to argue that the Chinese system performs these four functions better than the American—or even the Indian—system. The second way in which Bell evaluates performance is to identify it with a value he labels “harmony.” To spell this out, he directs the reader to two appendices to the book that are published on the Princeton University Press website. One of them appears in the form of a dialogue between Bell and an impressively articulate propaganda official named Zhao Bing Bing. She states, “I personally think, in the context of China, that communism basically is the same as [the Confucian ideal of] ‘the world of great unity,’” and adds, “The essence of our values should be: in harmony with the sky, with the land, with the people…; it should be the harmony that one may easily stay calm, that people do not argue with one another, that humankind and nature coexist well, and that the world is peaceful.” Knowing how power is used in China, one reads these words with a shudder. Bell complains that his writing over the years has been widely misunderstood. He writes that when he has previously presented his ideas, “I was ruthlessly savaged by critics, accused of being everything from an apologist for the CCP to an agent for Goldman Sachs (my wife’s employer). Hence, I realized the need to write a book with more detailed and nuanced argumentation” (p. 12). The footnote to this passage continues, “I haven’t responded to any of these critiques (except for one particularly unfair article that contained misleading information about my wife) because I realized that any response would need to be very detailed to be persuasive. I’ve faced the same problem whenever I’ve presented parts of this book at seminar and lectures at universities around the world… Hence (and I apologize if this sounds pompous), I literally had to write a whole book to answer the criticisms” (p. 200). Some of the criticisms that Bell believes were based on misunderstandings are similar to the ones I have made here. When a body of work continues to elicit the same criticisms despite repetitions and refinements, the writer must bear the responsibility. Why don’t we read The China Model as a critique, rather than a defense, of the Chinese system, since Bell is so frank about the system’s flaws? It is because Bell diminishes the system’s problems as passing, inessential faults that need to be corrected so the system can be more like its real self. As Bell puts it, the Chinese system is “partly good” and “can be improved” (p. 8). And why don’t we read the book as a work of political theory, a conceptual “defense of political meritocracy” whose validity does not depend on an endorsement of the Chinese regime? It is because, living in China, knowing a lot about China, claiming to compare China to other systems, and describing the China model as “both a reality and an ideal,” Bell is encouraging readers to read him as if he were writing about China. Yet the China model—“a vertical model with political meritocracy at the level of the central government and democracy at the local level” (p. 152) does not exist. And it has no prospect of coming into existence under the auspices of the Chinese Communist Party.